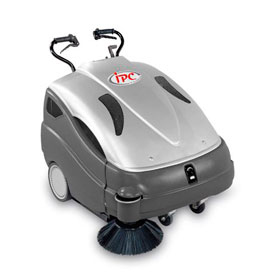 The IPC Silver Genius 710ST walkbehind sweeper is ideal for clearing away dirt and debris. Powered by a 4HP Honda engine it is proven to have great productivity with a huge hopper capacity, large 70cm sweeping path and an extensive filtering surface. It gives high performance with features such as the main brush pressure adjustment and a dust flap for large debris collection. This sweeper is ergonomic and user friendly with an easy to use control panel, greater working visibility, designed to assure minimum noise levels. It also has low maintenance costs with easy access to internal components and its dust filter, main brush and side brush can all be replaced without any tools. Lastly it is designed with a heavy duty chassis in fully coated steel and has maximum protection against impact making this a very robust and durable sweeper. Perfect choice for airports, shopping centres, warehouses, offices, petrol stations and factories.